Providing a strong dental benefits package may help improve the health of employees and reduce costs linked to employee illness. 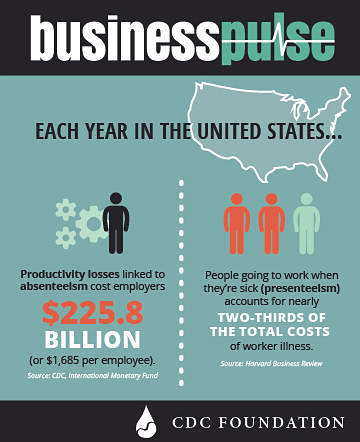 With the rising costs of employer-paid health insurance, not to mention the tangible costs of employee sick time, smart business owners focus on employee wellness as a way to increase productivity and reduce costs. From company gym memberships to serving healthy food in the employee cafeteria, there are a number of ways businesses can create a culture of health and fitness in the office. But have you considered your employees’ dental coverage? Preventative dental care doesn’t just reduce sick days due to mouth pain or oral surgery. Studies show the advantages of good dental health extend to employees’ overall health. Poor dental health has been linked to a surprising number of other illnesses. Periodontal disease and its predecessor, gingivitis, has been linked to heart disease. The bacteria that causes these diseases can enter the blood stream and travel to the heart, where it causes the arteries to harden. This condition has been linked to heart attacks and strokes, which are leading killers in the U.S. and also two of the most expensive health conditions in a workplace. The bacteria present in the mouth of those with gum disease doesn’t just affect the heart. Breathing in these harmful bacteria can cause respiratory infections, including pneumonia. Medical professionals aren’t sure why, but diabetics with gum disease have a harder time controlling their blood sugar levels, which can increase many of the health risks associated with diabetes. Treating gum disease as soon as it’s detected can help those with diabetes live healthier lives. New research shows that taking steps to prevent gum disease, such as brushing and flossing regularly and seeing a dentist twice a year, may also help slow the onset of Alzheimer’s Disease. It’s possible that the higher levels of antibodies present to fight periodontal bacteria in those with gum disease leads to inflammation in other parts of the body, including the brain, which can speed cognitive decline. With the vast number of older Americans in the workforce today, slowing or preventing the onset of Alzheimer’s should be a consideration in any organization concerned about the overall health of their employees. Just as poor dental health can cause a number of other illnesses gum disease may also be an indication of other diseases. Regular dentist visits may help detect underlying problems, including heart disease, that require a doctor’s care. Offering employees good dental benefits as part of an ancillary group benefits package encourages regular dentist visits, cleanings, and other preventative maintenance, which can improve a person’s overall health. And healthier employees are more productive employees. A good dental benefits package with low premiums and a focus on coverage for preventative care can save your company money in the long run. The DBL Center can link you with a best-in-class insurance carrier to provide the dental benefits and other ancillary group benefits your employees need to stay healthy and productive.